Interview with Nidzara Ahmetasevic, activist with Are You Syrious? Bosnia has had a troubled recent history. What is the current political, social and financial situation? We are one of the most corrupt countries in the world, where rule of law isn’t enforced, citizens lack basic human rights and there is no-one to defend these rights. People are very poor and over 100,000 people have left the country over the last 10 years at least. Over 60% of youth are unemployed and general unemployment is one of the highest in the world and certainly in Europe. Then we have the arrival of thousands of migrants and refugees and people looking for a better life. It creates a very difficult situation that we have to try and find a way to deal with. When did this rise in numbers of asylum seekers arriving in Bosnia begin and where are they usually arriving from? Migrants have always been coming through Bosnia to get to the EU, it increased in 2015 of course like everywhere else, but not that much as Serbia and other countries were a much more logical route. Nevertheless, as the EU is finding more and more ways to seal their borders and violence at these borders increased- especially in Hungary, Bulgaria and Croatia- people found Bosnia to be the last country on the route to the EU where they can try to find a way. The numbers started really increasing in December last year. In some ways it links to the death of Madina Husseini at the Croatian-Serbian border. For many people I spoke with that was a trigger to find a new route, because people are petrified of the treatment by Croatian police and the EU is not stopping the violence at any of the borders. People are coming from Serbia and Montenegro, the people coming from Montenegro are normally coming from Greece, through Albania. Most of them are people who have been stuck in Greece for a long time, who were unable to not only move but also to obtain any kind of documents that will allow them to start a normal life. Some of them were waiting for their first interview for over two years. There are many people coming from the islands where they were in overcrowded, inhumane conditions. There are also many people coming from Bulgaria through Serbia complaining of inhumane conditions in camps in Bulgaria, they have been telling volunteers here that they were treated like “dogs” in these centres. People coming from Serbia also complained of living in this limbo, stuck in camps there for a very long time. I’ve met some people who don’t want to go on to EU member states, but want to stay in Bosnia, they’re tired of being forced to move around. They have to find somewhere to start a life. Greece is not giving them that option, neither is Serbia. Bosnia is also not an option to be honest because it’s not a good place to live even for Bosnians. Life in this country is extremely difficult and I think we all think daily about leaving for good ourselves. But maybe Bosnia is simply their only choice. And for some reason they feel comfortable in Bosnia, mostly because of the reaction from the locals. They are accepting migrants in a way which many migrants told us they rarely encountered so far. I’m sure people come here because they hear about police and local people being open and welcoming. What has been the response from local population? Meeting people who are going through this kind of struggle is a post-traumatic experience for many Bosnians, including myself. Many locals and migrants begin exchanging stories from the war and stories from the time when they were refugees or about family members or friends who left recently. I’m not sure if this is a good or bad reaction but there is a sense of commonality and mutual understanding. Someone coming from Syria to Bosnia, they don’t have to explain anything to us. We survived all that, we have been there, we know. I do believe that for some asylum seekers coming here, it gives them some kind of hope that things can be better or at least they can survive this very difficult period that they are going through. Because they see us and see it’s possible. In areas which were hit the hardest by the Bosnian war, like Višegrad, there are many people who were refugees and were expelled from their homes, survivors of war crimes, who are helping people arriving there in every possible way. What are the main nationalities of people arriving in Bosnia? There are people from Afghanistan, Maghreb countries, Libya, Iran, Kurds, Iraq. It’s mixed but recently we are receiving quite a big number of Syrians. Which for me is a surprise. I’ve been volunteering with refugees for the last three years and in my experience the arrival of Syrians is new and increasing. Syrians are more likely to be granted protection in Greece than many other groups and perhaps therefore less forced to travel. What are the reception conditions like? I can’t even talk about conditions because the government has made no effort to provide accommodation for people. There is a small asylum centre in the mountains near Sarajevo with a capacity for only 160 people. This year over 1,500 people officially entered the country. I heard UNHCR (the UN Refugee Agency) and IOM (the UN Migration Agency) are trying to convince the local government to open another centre near the city of Mostar for around 300 people. Who are the main organisations; NGO’s, charities, grassroots groups; working on the ground in Bosnia? UNHCR and IOM are present. MSF is coming from Serbia once a week. Primarily the response is from grassroots groups like Souls of Sarajevo, which I am part of, organising amongst ourselves doing what we can, calling our friends and asking for help. We have one local charity Pomozi.ba which usually helps poor Bosnian people, the most valuable help is from them as they collect money, which people specifically donate for refugees, and donations which they distribute to us or directly to people that need help. 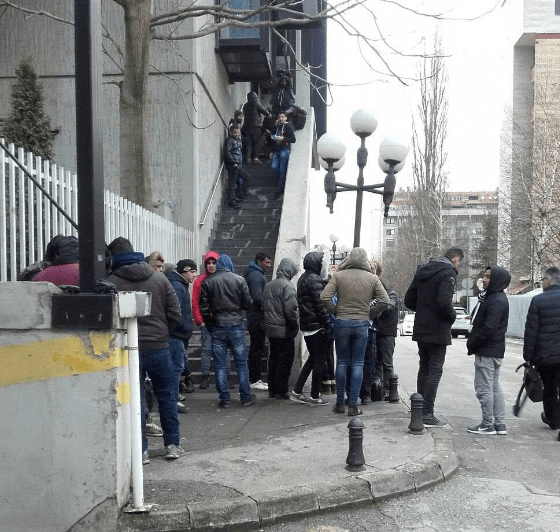 But citizens in Sarajevo, citizens in Bihać, citizens in Zenica, citizens in Konjic, citizens in Visegrad, citizens in Mostar- in all the cities citizens are the first and sometimes the only ones supporting migrants. They are letting them stay in their houses, paying for hostels- UNHCR recently started doing this as well. Some international volunteers have come here, not many, everything is in very small numbers so far. It’s a new route so it will take some time before structured support picks up. However, volunteers on the ground desperately need help. Every day we are feeding between 150 and 200 people on the street and there are probably many more who we are unable to reach. We have a small amount of donations but we need to buy food, sleeping bags, medical help and it is getting harder and harder as the number of people is increasing every day. Sooner or later we will also have to find a way to help people that want to stay in Bosnia long term. What is the response from the government? Local officials are using hate speech when they are describing migrants and asylum seekers present in Bosnia and are often describing them as “fake” asylum seekers, even though most of them haven’t even had a chance to interview for asylum. One high ranking official from the Ministry of Security said 95% of people coming to Bosnia are drug addicts and criminals. Officials are often trying to impose labels of terrorism- when there isn’t any connection. There is not enough being done to help asylum seekers deal with the very complicated state structure Bosnia has. Bosnia is a semi-protectorate, the only one in Europe, as such we have three levels of government and two Entities – the Federation of Bosnia and Herzegovina and the Republika Srpska- and it is very difficult, even for Bosnians, to operate in this complicated system. At the same time there is not enough of an effort made to get people registered so they can start their asylum process. We have a Ministry for Refugees and Human Rights who are not currently involved at all. People are prevented in every way from seeking asylum, which is a huge issue as they are unable to access many of their rights, including medical and educational. They go every day to try and register, there are huge lines outside of UNHCR (pictured). It’s very unclear as to what people should do. How are people supposed to stay here? It’s very difficult and complicated and I’m not sure how it can be fixed but I’m sure that it can. As long as we respect the rights of refugees.